In view of Section 2(13), business includes any (a) trade, (b) commerce, (c) manufacture, or (d) any adventure or concern in the nature of trade, commerce or manufacture. It covers every facet of an occupation carried on by a person with a view to earning profit. The word “business” is one of large and indefinite import and connotes something which occupies attention and labour of a person for the purpose of profit. Business arises out of commercial transactions between two or more persons. One cannot enter into a business transaction with oneself. As per section 2(36), profession includes vocation. As profits and gains of a business, profession or vocation are chargeable to tax under the head “Profits and gains of business or profession”, distinction between “business”, “profession” and “vocation” does not have any material significance while computing taxable income. What does not amount to “profession” may amount to “business” and what does not amount to “business” may amount to “vocation”. 1. Business Incomes Taxable under the head of ‘Profit and Gains of Business or Profession’ (Section 28). Rent of house property is taxable under section 22 under the head “Income from house property”, even if property constitutes stock-in-trade of recipient of rent or the recipient of rent is engaged in the business of letting properties on rent. Dividends on shares are taxable under section 56(2)(i), under the head “Income from case of a dealer-in-shares other sources”, even if they are derived from shares held as stock-in-trade or the recipient of dividends is a dealer-in-shares. Dividend received from an Indian company is not chargeable to tax in the hands of shareholders (this rule is subject to a few exceptions‡). Winnings from lotteries, races, etc., are taxable under the head “Income from other sources” etc. (even if derived as a regular business activity). Such interest is always taxable in the year of receipt under the head “Income from other sources” (even if it pertains to a regular business activity). A deduction of 50 % is allowed and effectively only 50 % of such interest is taxable under the head “Income from other sources”. Profits derived from the aforesaid business activities are not taxable under section 28, under the head “Profits and gains of business or profession”. Profits and gains of any other business are taxable under section 28, unless such profits are exempt under sections 10 to 13A. 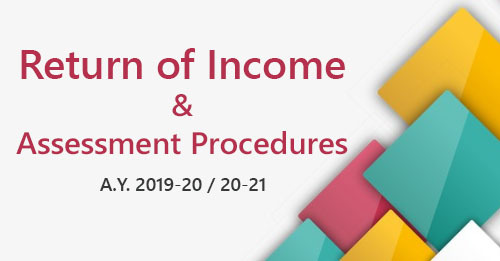 Interest received by an assessee on compensation or on enhanced compensation, shall be deemed to be the income of the year in which it is received (however, it is taxable under section 56 under the head “Income from other sources”). The claim for escalation of price in a contract or export incentives shall be deemed to be the income of the previous year in which reasonable certainty of its realisation is achieved. Assistance in the form of subsidy (or grant or cash incentive or duty drawback or waiver or concession or reimbursement) as referred to in section 2(24)(xviii) shall be deemed to be the income of the previous year in which it is received, if not charged to income tax for any earlier previous year. Business or profession should be carried on by the assessee. Income from business or profession is chargeable to tax under this head only if the business or profession is carried on by the assessee at any time during the previous year (not necessarily throughout the previous year). There are a few exceptions to this rule. Income of business or profession carried on by the assessee during the previous year is chargeable to tax in the next following assessment year. There are, however, certain exceptions to this rule. Profits and gains of different businesses or professions carried on by the assessee are not separately chargeable to tax. Tax incidence arises on aggregate income from all businesses or professions carried on by the assessee. If, therefore, an assessee earns profit in one business and sustains loss in another business, income chargeable to tax is the net balance after setting off loss against income. However, profits and losses of a speculative business are kept separately. Under section 28, it is not only the legal ownership but also the beneficial ownership that has to be considered. The courts can go into the question of beneficial ownership and decide who should be held liable for the tax after taking into account the question as to who is, in fact, in receipt of the income which is going to be taxed. Anticipated or potential profits or losses, which may occur in future, are not considered for arriving at taxable income of a previous year. This rule is, however, subject to one exception: stock-in-trade may be valued on the basis of cost or market value, whichever is lower. The profits which are taxed under section 28 are the real profits and not notional profits. For instance, no person can make profit by trading with himself in another capacity. Any sum recovered by the assessee during the previous year in respect of an amount or expenditure which was earlier allowed as deduction, is taxable as business income of the year in which it is recovered . The mode or system of book-keeping cannot override the substantial character of a transaction. The income-tax law is not concerned with the legality or illegality of a business or profession. It can, therefore, be said that income of illegal business or profession is not exempt from tax.